NJ Locksmith & Door Service Company is your complete full service locksmith and door repair company for all your needs. We have been servicing Hudson County and surrounding areas. for over 25 years. We specialize in Commercial Locksmith services for industrial, educational, small business, corporate offices, retail stores and shops, apartment complexes, and property managers. We currently have many clients in the Newport Jersey City Commercial District, Hoboken, various Port Authority & PAPD locations, and many other businesses and school campuses across the area. We provide rekeying and master key services as well as repair and installation of all the common door locks in your building. 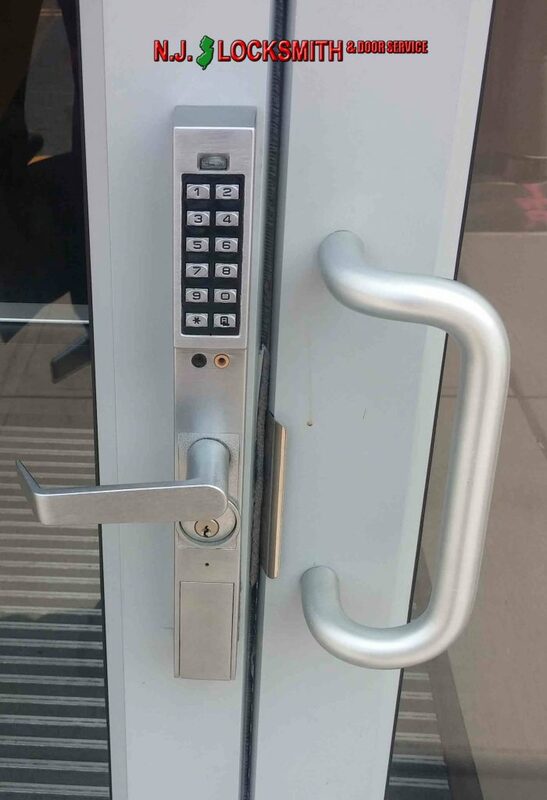 we can service, repair and install panic/ exit bars, alarmed or not, digital combination locks, electric strikes/buzzers, and all other types of door hardware. NJ Locksmith and Door Service can also repair all of your door problems, from worn or damaged hinges or pivots causing doors to sag or not close properly , to replacing and installing door closers surface mounted or concealed. See our door repair page for more info. We can make keys for your office equipment, i.e. desks, file cabinets, etc. We offer high security key systems to offer a higher level of security such as pick and bump resistance. Also Our Medeco high security lock keys can't be copied without your permission! See our MEDECO page for more info. We offer fast lock out service, Free estimates and Emergency Service. Call NJ Locksmith & Door Service Company today!